Network Marketing is a fast and affordable to start a home business. But like any other type of business, making requires that you sell your products or services. Of course one of the perks of network marketing is that you can help others start their own business and earn an income off their sales volume as well. Going through all the materials in your business kit, including reading all of the company policies concerning marketing. Study the company's compensation plan, and what perks and benefits the company offers, so you know what you need to do to make money and earn bonuses. Many companies have quick start programs and bonuses that you'll want to pay attention to. 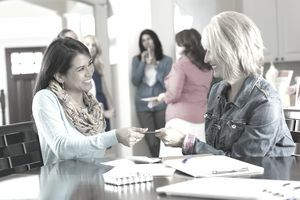 Connect with your sponsor for information on workshops, trainings, and other resources to help you. Once you have a good sense of your company and how it works, it's time to start building. To promote your products, you need to develop a marketing plan the same as you would for any other business. That starts by knowing who the most likely buyer of your product/services are, finding where they are so you can market to them, and then creating marketing materials to put in front of them. Building a team of business builders is slightly different. While many of your customers may decide to start their own business, you can also market for people who are looking to start a home business. How Do You Find Potential Network Marketing Team Members? As a network marketer, you want to choose your sponsor carefully, but so too do you want to choose your teammates with as much care. Like marketing your product or service, you need to determine a few things about your ideal team member before you get started. You'll be training and spending a lot of time with your team, so you want to be sure you find people who are the right fit for you and the business. Type of Personality - Do they get along well with others from all walks of life? Do they only share funny, G-Rated jokes? Level of Education - Does it matter if they have a high school diploma or college degree? Past/current Employment - Are they currently employed so they have working capital? Do they have a hard time keeping a job? Life Goals- Are they looking to better their lives and want to help others do the same? Are they seeking to live by their own schedules? Type of Family- Are they single, married, with or without children? How many people do they have to share their schedules with? While there is no right or wrong network marketer, you want to have people on your team who are coachable and you relate to. These should be people like you who are committed and will follow through on the goals they set for themselves. You are hosting your first workshop and you invite some of your team members to participate. How would you feel if your team members did not get along with your guests? What if those team members were telling inappropriate jokes to your guests? You want team members who believe in the business, are positive role models, and present themselves as professionals no matter where they spend their time, whether that be at another job, church or a community event. There are many places you can meet people who might be interested in building a business with you and your company. Your sponsor and company will have tips to help you do this. Often they'll suggest that you make a list of 100 people you know or run into on a regular basis. While this can be helpful, it's not ideal. Remember, you're looking for people who want what you're offering. Your friends and family might be supportive, but if they don't want your product or service, or to start a home business, you're wasting your time presenting to them, except for practice. Another recommendation is to follow the 3-feet rule. While this makes you a friendly person, and it's possible you'll find someone who's interested, it can also be a waste of time if they're not interested in what you offer. It's possible to buy networking marketing leads. The problem with this is that the most reliable ones are expensive, Second, chances are they responded to a generic work-at-home offers, and aren't expecting to hear about networking marketing. In the worst case scenario, they forgot they entered their contact info into a lead form and get mad when you call them. How can I get in front of them. Website: Many companies offer a website to their reps. If you're allowed, consider starting a blog or your own website so you can stand apart from the crowd of thousands of other reps. Some companies have teams of reps that have their own websites too. But again, you'll be getting a website like a ton of other people, which can make it hard for people to pick you over someone else. Social Media: Like any other business, you can build relationships through social media. Don't simply post, "start a home business with me." Instead, you want to become a resource for successful home business ownership. People choose their sponsor in network marketing. They're looking for someone who is successful, knowledgeable and helpful. You can show all of that through social media. Video: YouTube is one of the most visited sites on the Internet. If you can make engaging and informative videos related to building a home business, dispel myths about network marketing, and other work-at-home tips, you can generate a lot of interest in your business. Network and Referrals: Whether you meet people online or in person, they may not be interested in your business, but they might know someone who is. Develop a system of building relationships through your network and asking for referrals. When approaching a possible team member, don’t try to sell your business opportunity or products off the bat. Even if they've filled out your contact form or called you, don't go in for the sell right away. What was that day's topic about? Once you know that information, you can use it to find the solution your company offers. Date every conversation have with them (it can take several conversations before they decide to join with you). The place you met. If you met this person in a Facebook group you will write down the group name so you can easily find them again. Perhaps you will find additional team members there next time you visit! This information will be helpful as you'll be able to tailor your product or business pitch to meeting the needs of your prospect. How Many People Should You Talk To? You'll often hear that sales is a numbers game, so the more people you talk to, the more sales and enrollments you have. This is not wrong; however, if you're generating interested leads, you'll have better results than if you try to talk to everyone. For example, you can talk to 100 people you meet on the street, and maybe get 5 enrollments (1 in 20). However, it's possible to talk to 50 people who specifically request information to get the same 5 enrollments (1 in 10). Same amount of results talking to half the number of people. By tracking your numbers, you'll have a better sense of how many people you need to talk to reach your goals.